The NECC tragedy involving compounded drugs was the largest healthcare-induced public health tragedy in many years, killing 64 and sickening more than 700 others with vials contaminated with fungi (CDC). Massachusetts responded with a quick set of emergency regulations and inspections, but everyone knew more structured rules were necessary. Almost 2 years later, after careful study & following legislative action by Congress, the Massachusetts House and Senate passed an excellent new law (my NEJM profile of it is here), unanimously. 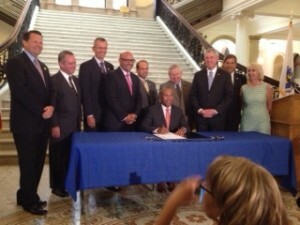 Governor Patrick signed it this morning. The law is a model for the states, closing loopholes in a thoughtful way while effectively complementing the relatively weak new federal law. The only thing I’d change can be addressed in regulations: require compounding pharmacies to carry adequate insurance.